When we share out experience of motherhood we talk about the challenges such as exhaustion and losing ourselves and the exhilaration of love and satisfaction that being a mum can bring. But it’s not so often we talk about loneliness. Occasionally, the conversation is about how hard it can be to be the mother of a small child – the loss of social life or the shrinking of your world to where your pram can get to. I never experienced this loneliness as a mum, I had my family nearby, my grandmother lived with me and then my in-laws would stay for five months every year. I would return to work after maternity leave, where I would have friends to go to lunch with. Hubby was always my sounding board and my sisters are good to talk to too. Perhaps I never had time to be lonely, if anything I was so rarely alone that I craved and savoured moments of isolation. But then being surrounded by people, is not the same as not being lonely. For the first time in my life I am getting first hand experience of what that means. 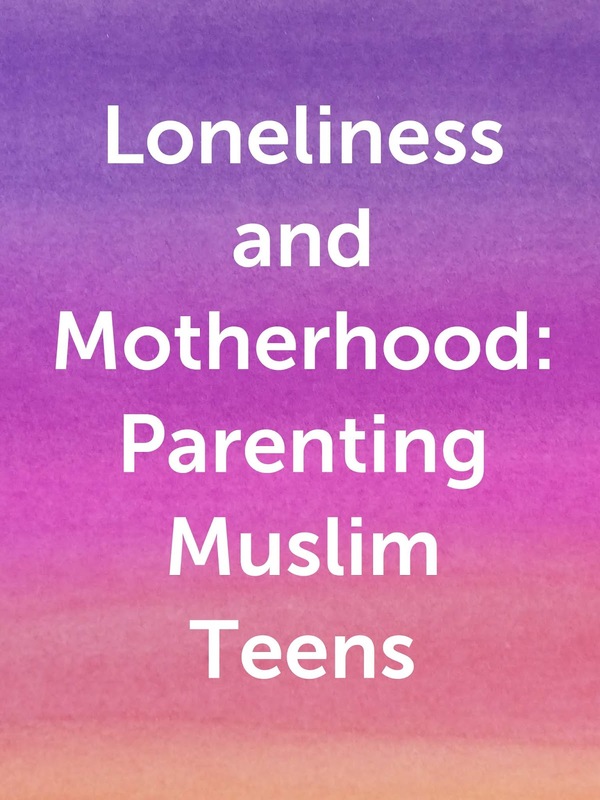 Parenting teens can be a lonely business. Your little ones put you on a pedestal, you are the best mum in the whole world, the loveliest and the kindest. As they approach their teens, their opinion changes and sometime it’s as if nothing you do seems right. You set boundaries, so restrict them from what they want. We have had a tug of war over more freedom for my children that neither of us seem to be winning. Everything you do or say leads to eye rolling and complaint. All of the hard work you put in when they were small seems to have been ineffective and the kids are suddenly questioning your values about hijab, Quran study, music and all sorts of other things. Where you were celebrated, now you are the focus of all complaints and you feel as if everything you do is wrong. I remind myself that some of this because I am my children’s safest space to vent and dump their frustrations, sometimes they just need reassurance or a little kindness and attention. It still doesn’t make it easy and sometimes I find myself veering between questioning everything I do and steeling myself against criticism enforcing the boundaries in what feels like a heartless way. The loneliness is not just inwards, but outwards too. When your little ones are tiny, everyone shares the pain. People know about the discomfort of pregnancy and childbirth, followed by the sleepless nights, nursing and all that goes with a small baby then a toddler (potty training anyone?). If they don’t know, you are happy to share it with people and there is always another new mum who you can share stories with. But people are not so quick to talk about their teens. Not when things are not peachy perfect. Who admits if kids aren’t doing well at school, or when they suddenly go from cute to gangly, spotty, funny looking things. My oldest won’t let me take pics of her anymore and certainly I wouldn’t dare share them with anyone, she would see that as a breach of trust. 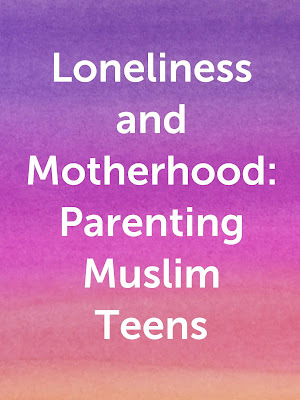 No one wants to admit that their daughter is being flooded with hormones and a superficial culture that is making her question wearing hijab so young or boys that just can’t see why they can’t play on the streets or go to the park alone like their friends. More and more I cans see that they are testing their boundaries and questioning everything in a way that is normal for their age. I am sure they are not the only ones. But when people ask how they are, you say fine, all good and smile. They do the same and no-one admits that their teens are anything less than perfect because if they are not amazing by this point, it is clearly too late and you are a loser who could not bring their children up properly. So you continue to deal with the battles alone – feeling vilified and questioning all that you have done. Family is not much better - your other half is just confused and annoyed about what happened to your previously lovely children, your in-laws offer unsolicited advise that feels judgemental and makes you feel a failure and your parents still think their grand kids are perfect and you must be doing something wrong. Although my mum occasionally reminds me wryly what I was like as a teenager. My siblings all have small children who have a long way to their teen years (although we occasionally call the little girls three-nagers because of their diva attitudes). Remembering my own teenage years – I remember being irritated by my mum as a teen and not agreeing with her about anything. I think I am slowly turning into her now and I love her like crazy and feel very protective about her now. Trust in Allah and your own hard work – all those dua’s, those salah’s and supplications. All the effort and self-sacrifice. When you do it for Allah (SWT), I know He doesn’t waste a single word or deed or second of pain or discomfort that you have said or done out of His fear or love. I trust that my kids will come out of their teen years and what we taught them will make itself apparent in their lives and behaviour. I do believe they will be good people one day insh’Allah. No I believe they are now. Remembering the vulnerable little ones they were – When Little Lady makes me want to shout, I remember the time I brought her home for the first time from the hospital. I used to try and make her smile every day. so I can take a picture. How much I loved holding her. I remember being confused at how funny she looked when she was born and promising I would love her anyway. She is still the same and I still love her the same. The other day I was tiding her room and found an old doll she had since she was tiny tucked in a corner of her bed. I laughed out loud, despite her old soul she does still have some of that messy, playful little girl in her. I would love to hear from mothers going through this or who have come out the other side and learn from them. Assalam ayakoum warahmatullahi wabarakatuh dear Sister! I cant agree more on the smiling and "everything is fine" though, really this is the case with so many people, Alhamdulillah for my best friend who I can share all these concerns with. But yeah, most people just smile and while I dont like to complain and would like to be grateful generally, there is the time when I just have to. Allah bless you and your family, and help you through this time. "Fa inna ma'al 'usri yusra Inna ma'al 'usri yusra" -Verily, along with every hardship is relief. Verily,along with every hardship is relief.